Motivational speaker Derek Clark’s mantra is “Never Limit Your Life”. Before being placed in foster care, he suffered economical and physical impoverishment, brutal child abuse and was abandoned at the county emergency psychiatric unit at the young age of five. He was helpless, homeless and hopeless. Derek was then referred to the foster care system where he would stay for the next thirteen years of his life. Motivational Speaker Derek Clark Delivering a Powerful Keynote Speech in Austin, Texas. international motivational keynote speaker to being a father of four children and married to the love of his life for twenty two years. As the author of eight books including the award winning I Will Never Give Up book series, Derek’s true-life trials and triumphs have inspired hundreds of thousands to push themselves beyond their self-imposed limitations. He believes that professional success always begins with the positive personal outlook. With the right attitude, adversity is the spur to enrich the future of any enterprise. Optimism and striving for greatness are not only contagious, but the keys to higher productivity. 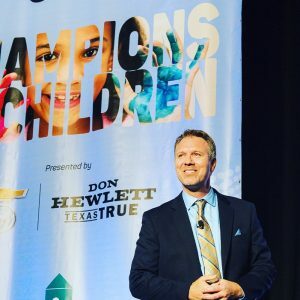 When you reserve Derek for your conference keynote presentation, he is going to reveal the secret behind his personal and professional success and how he overcame great adversity.